In the year-and-a-half that I've served as N's guardian, he's lived and traveled mainly in the northern half of the country. And I think he's mostly had a good time. Some might say TOO good of a time (little drinking issue). I now know that his buoyant moods were partially due to the fact that it was spring and summer when he made appearances. The whole six months that I lived in Chicago, N stayed in a drawer nestled up to my knee socks and woolly hats. He didn't even answer when I asked him if he wanted to accompany me on last winter's High School Musical tour. Just scraped his way deeper under the socks. Once I got to California, I took N out of hibernation, thinking he'd undoubtedly be thrilled by the weather, if nothing else. I mean, I moved here for love and for that reason alone was open to Los Angeles. N would find his own incentives, starting with our bike ride. 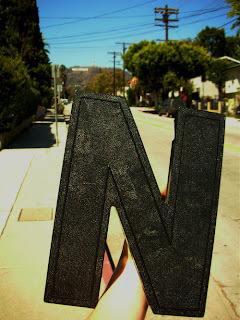 As soon as N saw the Hollywood sign he was like WHAT. 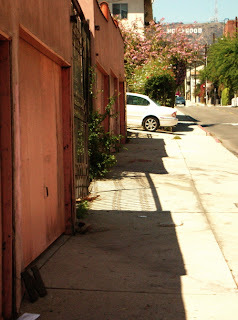 In the bottom left corner, you can see N slumped against a garage door, all dejected because the Hollywood letters are so FAMOUS and get to be FIFTY FEET TALL and he's LITTLE and NOBODY. For a minute last year in Detroit, he thought he might be somebody because he was the N in Nights Of Fire for Benise's marquise. I reminded him that he's the one who jumped off into mine and Renee's path. That maybe he didn't like being up there. Or that maybe he was just scared, but not to let his own insecurities and fears hold him back or make him bitter. I also reminded him that we didn't move here for fame. That I actually wasn't sure anymore WHAT I moved here for but that nonetheless, it's just a place. So I took N to another street and held him up high and pointed out that from this angle, he looks way bigger than HOLLYWOOD. oh my wounded heart soars with N..